I named this bangle Shutters because it reminds me of window blinds. 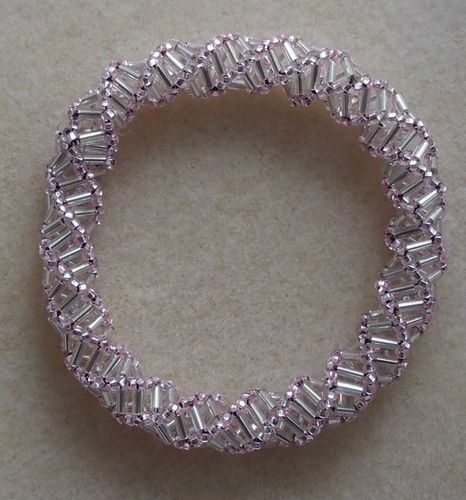 This bangle features the Russian Spiral technique with the use of bugle beads. I have labeled this tutorial easy because while a beginner is certain to be able to complete, there are beading techniques that are used (ex: half hitch knot, threading a needle) that are not demonstrated, so a beader will have to have knowledge of these skills prior to attempting this tutorial. There are 2 designs featured within this one tutorial, one is the basic bugle bangle and the second is the embellished bugle bangle. As noted within the tutorial, please read all the directions first prior to beginning, since the embellishments are optional. This is a fun bracelet and it lends itself to plenty of variations; it is also a light weight bangle that will make a great gift or accessory to your favorite outfit.